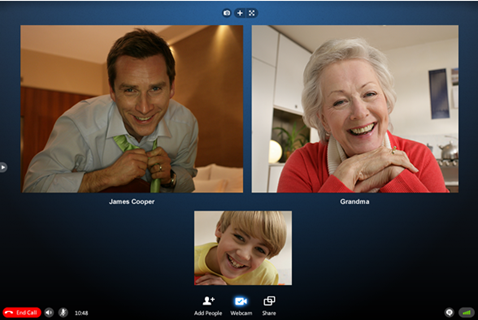 You are here: Home » New Skype Beta Gets Group Video Chat. Not Free. Skype is one of the best & popular video chat clients and we use it to chat with our parents and family in India. The chat video is pretty amazing compared to other video chat clients even when one end is in a low bandwidth connection. One feature we have missed is a ‘group video chat’ feature and we couldn’t conference in 2 different families for a common video chat. The new Skype beta download has gotten a preview of the group video chat feature.the feature is in beta so it may not work perfect all the time. To make group video calls, the people you’re calling will also need to be running the new version, so make sure you let your friends and family know they can also download the beta by posting this on Facebook and Twitter. Once you’re all set up, it’s easy to start a group call – just use the Add button to invite people into the conversation, and click the Video Call button. Skype group video chat is going to be part of premium services to be announced soon by Skype. While the voice call and one-on-one video chat remaining free, it is still a let down to know group video chat will be pay-only. Also, the new beta is Windows only and a Mac version is supposed to be out shortly. If you are looking to use a group video chat today (other than Skype beta), check out Tiny Chat. It is pretty cool. I should review it here sometime.